REM was founded in 1983 by the young Rocca’s brothers, Emanuele and Maurizio in order to merge their complementary skills in a company of their own. Strong of their technical know-how and experience, the initial plant included a total area of 80 square meters: it was the warehouse located behind the house of their parents. This was the first REM location. During its first years, REM was dealing with the design and the production of electrical systems, both for household and industrial use with the installation of electrical panels for machine tools and maintenance of automatic systems. 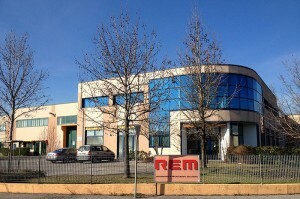 In the first half of the nineties REM starts diversifying and increasing its activities with the overhaul of the electrical and pneumatic part of machine tools, the digital programming of linear robot outside the machines, the programming with PLC SIEMENS S5 for the management of machines production processes, the use of HMI and systems for data analysis and monitoring through analogical cards. In 1997 REM moved to a new location with a total area of 450 square meters. Thanks to this expansion, the department of mechanical design was launched and REM became a manufacturer of equipment for industrial production processes. In 2006, a second production site opened with an area of 1100 square meters and over 700 square meters outdoor. Since then, REM has specialized in assembly lines, end-line test benches and vibrational test benches with the support of the newly opened Research & Development department and a specialised marketing department to support the expansion and development of business partnerships. More recently, REM has been exhibiting its products at major national fairs, such as MECSPE and SUBTECH, acquiring important contacts that opened the way to internationalization. REM is currently investigating the possibility of opening another European based location. REM is still led by Emanuele and Maurizio Rocca and with its thirty years experience can benefit from the contribution of its employees, whose know-how has grown, together with the company, year by year, project after project.